Genealogist Jillette Leon Guerrero theorizes that a significant factor in this lack of information is that many elderly Chamorus died in 1918 during the Spanish influenza pandemic. These elders therefore couldn’t pass on knowledge of their family history to their children and grandchildren. Fortunately, some are taking measures to address this problem for the future. Toni Ramirez, a historian with Guam’s Department of Parks and Recreation, began documenting oral history from Chamoru elders in the 1970s. 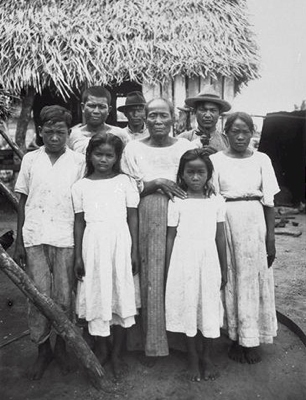 Today, Chamorus wanting to research their family roots can make use of extensive research made available by Ramirez as well as other Guam genealogists and oral historians. It’s important for Chamorus to record family history to help preserve our heritage and our culture. Additionally, it will allow those who follow to learn more about their roots and embrace other cultures and ethnicities. We Chamorus take pride in our culture and heritage and at times are blinded of how much of a melting pot Guam and the surrounding islands are. The desire to sense a connection with our family heritage is not unique to the Chamorus. Nevertheless, it is especially touching for those who have lost this connection, or feared its loss, because of hardship, displacement, or oppression. In today’s passage, most likely written during the Babylonian exile in which many Jewish people had been forcibly removed from their homeland, the prophet calls upon Israel to remember its roots in the story of Abraham and Sarah. For the Jews, looking back was meant to encourage their journey forward. Just as God blessed Abraham, God will comfort Zion despite the devastation of long exile. Judah will soon become an earthly paradise, God says. Though human existence upon the earth is short and tenuous, God’s salvation will be forever. Chloe B. Babauta, “Documenting Genealogy Connects Chamorus to Community, Roots, History,” Pacific Daily News, 17 Oct 2018 <https://www.guampdn.com/story/life/2018/10/17/genealogy-connects-chamorus-roots-culture-history/1563222002/>. • What do you know about your family’s history? What memorable characters have you found in your family tree? • What can be the benefits of researching genealogy? • How does studying genealogy connect us to the past? • What should be our attitude as we wait for God to act? • What role does memory play in our waiting for God? Deliverance or rescue from natural disasters, historical dangers, or from besetting fear. The terms in the OT…also have positive meaning, referring not only to restoration to health or safety but also describing or implying a situation better than that enjoyed before the difficulty or disaster came. For this reason, historical salvation and spiritual or eschatological salvation belong together and presuppose one another…. Israel’s prophets, psalmists, and sages worked out the particulars of divine salvation. The prophets pointed out that God’s interventions in the people’s behalf were expected to produce commitment to public justice, to covenant faith, to love and devotion to God and care for one another. When the community persisted in defiance of or departures from God’s way, they had only themselves to blame for disasters that struck and for the loss of a rich and full life on the land that God was providing for them. Even so, salvation remained God’s purpose and intention: Ezekiel could ask, “Why will you die, O house of Israel?” (Ezek 18:31). Walter Harrelson, “Salvation in the Old Testament,” Mercer Dictionary of the Bible, ed. Watson E. Mills et al. (Macon GA: Mercer University Press, 1990), 787–88. A new group appears in 51:1: “those who pursue justice.” Put another way, these “justice-seekers” and “God-fearers” are those who obey the call of 50:10, “Who among you (pl.) fears YHWH?” Like the call (“listen to me”) to coastlands and peoples afar (49:1; cf. 46:3; 48:1), now YHWH calls this community of righteousness. All the imperatives in 51:1, 2, 4, 6, 7 address them, inspiring the new generation of those who pursue righteousness and seek YHWH, the descendants of Abraham and Sarah (vv. 1-8). Not only seeking righteousness and fearing God, they epitomize the overcoming of obduracy…. Verses 1-8 contain divine address to the heirs of Zion, subdivided by three calls to listen (vv. 1-3; 4-6; 7-8). Who are they? Which ethnic group? What social class? This may have been a hotly debated issue especially at the dawn of the return of the exiles to Jerusalem and Yehud (cf. Ezra; Nehemiah). Our subunit offers its own definition of this group, albeit a rather loose and thereby more inclusive definition. In the opening call to listen, YHWH addresses those who pursue righteousness and seek YHWH (v. 1). The echo of Isaiah 1 helps divine this community as those no longer obdurate (6:9-10) who aspire to obey the divine commands (1:17). Not only to “hear,” they are also admonished to “see” (cf. 6:9) Abraham and Sarah—the rock and the quarry, respectively—their common ancestors (v. 2). We should note the rare occurrence of the two ancestral names together—Abraham and Sarah—whose stories of the promise of election, progeny, and blessing resonate in the thematic, and even compositional, juxtaposition between the exilic compiler of Genesis and Deutero-Isaiah…. From the intertextual connections between Ezek 33:24-29 and Isa 51:1-3, David Carr delineates the common expression (“Abraham was one”; Ezek 33:24 and Isa 51:2) in both texts with contrasting themes. Ezekiel, just prior to the fall of Jerusalem, criticizes people’s blind reliance on the tradition of Abraham, whereas Deutero-Isaiah, during and amid the exilic setting, proclaims for the exiles to find hope in Abraham: “In the time between the beginning and end of exile we have moved from Abraham as a false hope to Abraham as the rock on which hope should be based. Whereas current figures like ‘Daughter Zion’ and the anonymous servant of Second Isaiah symbolized the exiles’ suffering, ancestral figures like Abraham become a way for exiles to envision hope” (Carr 2014, 95). Hyun Chul Paul Kim, Reading Isaiah (Macon GA: Smyth & Helwys, 2016), 238–39.